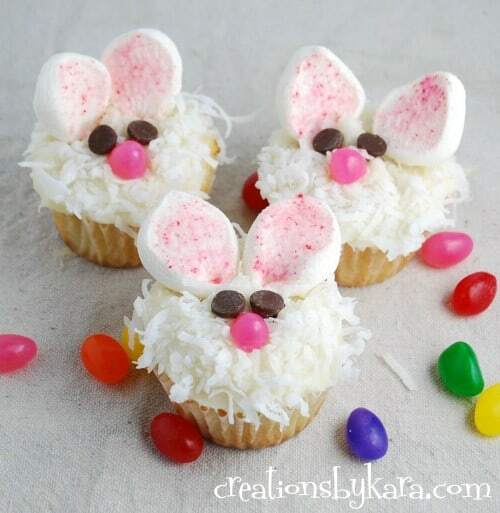 Easter dinner is just a little more fun if you serve these cute little Easter Bunny Rolls. They are not just adorable, they’re delicious too! 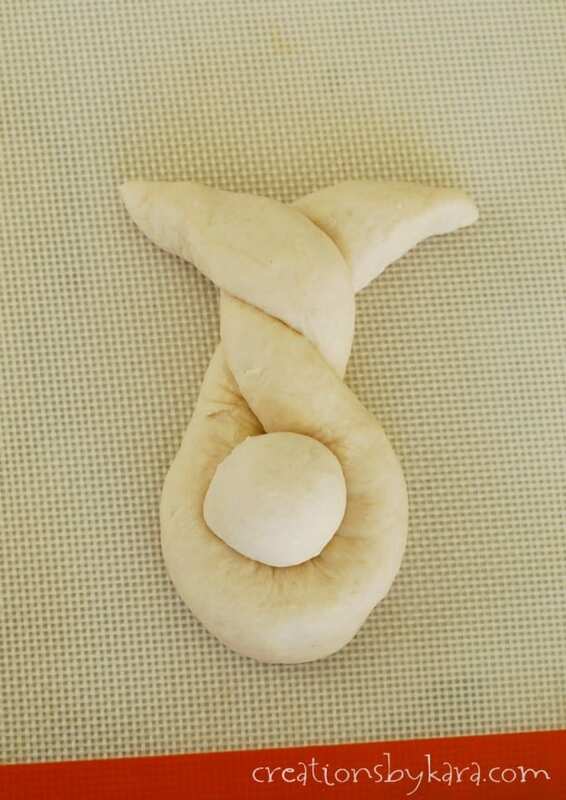 Feel free to use any dough recipe that you like. You could even use frozen dough, or the canned variety. It’s the shape that makes them fun! In large bowl (I used my Bosch), combine sugar, yeast, and water. Add milk, melted butter, oil, eggs, salt, and 2 cups of the flour. Beat till smooth. Add enough flour to make a soft dough. Knead for 4-5 minutes with the Bosch. 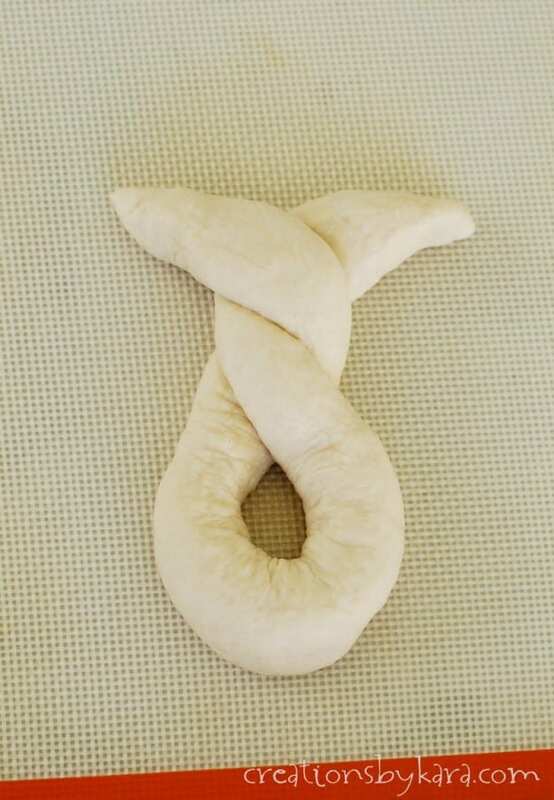 2-Bring the ends up and cross them over each other, forming a loop at the bottom. 3-I like to place them on cookie sheets at this point. Twist together one more time, then pinch the ends to form the ears. 6-Let the rolls rise till doubled, about 30 minutes. Bake at 350° for about 18 minutes. Brush with butter while still hot. Aren’t they the cutest little rolls you ever did see? 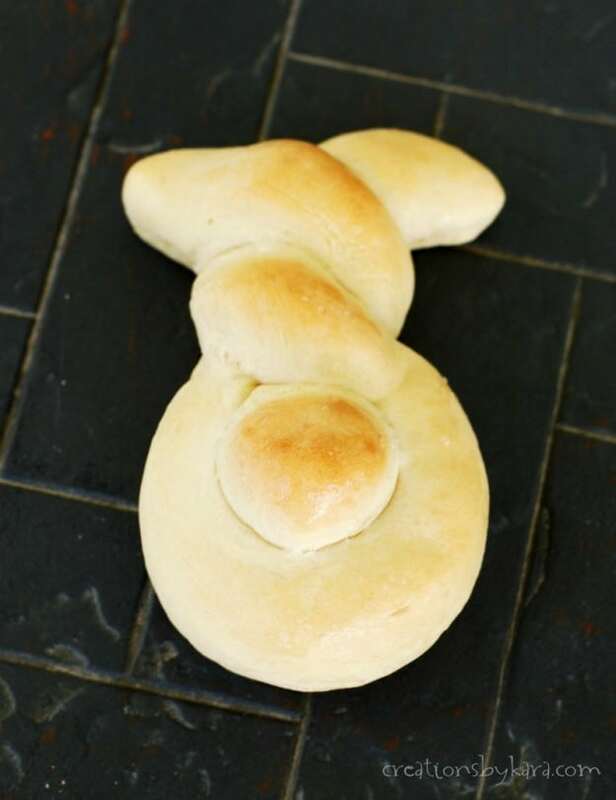 Soft and fluffy yeast rolls in the shape of bunnies. 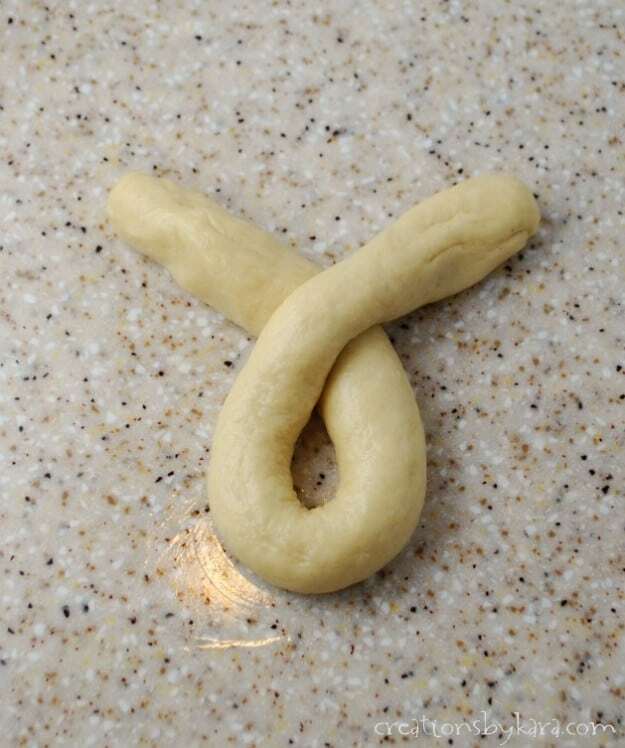 Break off pieces of dough and roll them into ropes. Make a loop and twist the tops together, forming pointy ears. Place on greased cookie sheets. 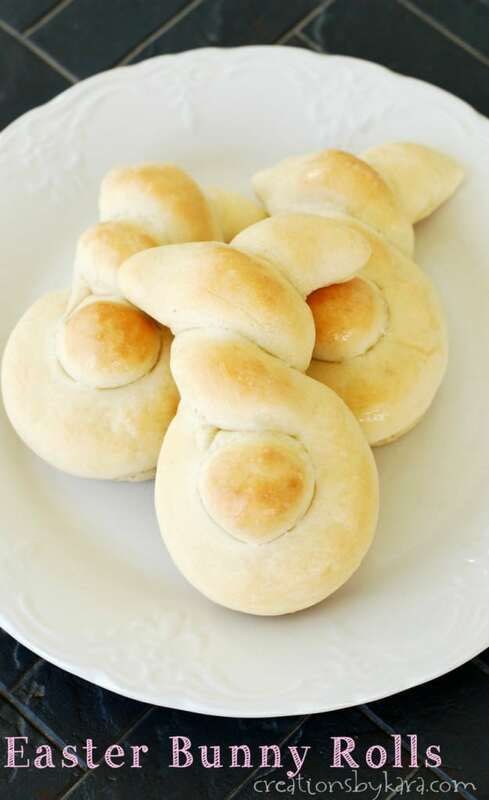 Then form balls of dough and place them on the loops to make the tails. Let the rolls rise till doubled, about 30-45 minutes. Bake at 350° for about 18 minutes. Brush with butter while still hot. How many does this make? Do I only have to let them rise the one time before baking?? Also, how big of a chunk of dough do you start with to for, the bunny body? Sorry to ask so many questions! Sorry I just saw your questions. I usually start with a circle about 1 1/2-2 inches, but you can make them any size large or small. Just make sure they are all the same size so they bake evenly. Larger ones will need more time to bake, smaller ones will be faster. I usually get about 2 1/2 dozen, but it totally depends on the size. When my kids help me, they tend to make them bigger, so we end up with fewer rolls. Just watch them as they are baking and take them out when they are golden brown. Hope this helps! What a cute idea! This will definitely be part of my Easter dinner this year! I did have problems seeing all of the pictures…is it just me? BTW, I’m your newest follower from Sweet Peas and Bumblebees! 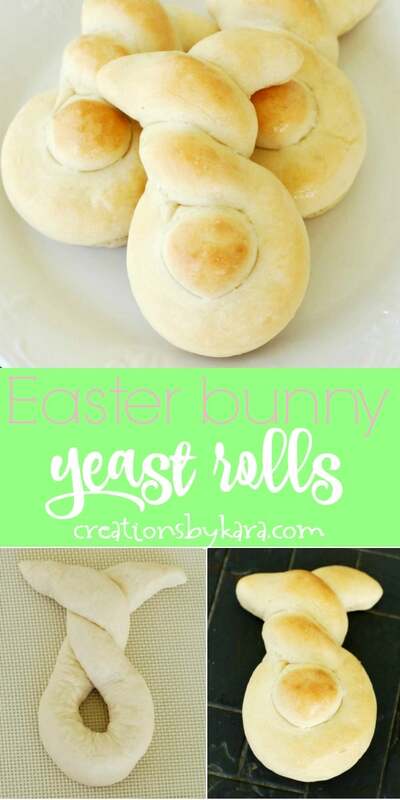 Kara, I have been out of the habit of blog checking for a while, but when I saw your picture of Bunny Rolls, It hit a soft spot in my heart. My dad always made these. My variation is a bit different, adding some orange juice and orange zest in my dough, then we have a glaze for them making them a little sweet. 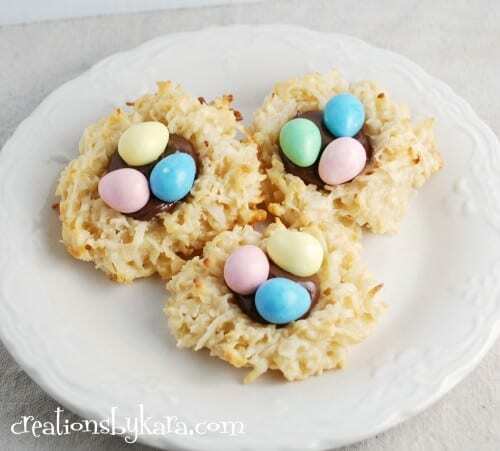 I'm making them this Sunday for a belated party we are having. 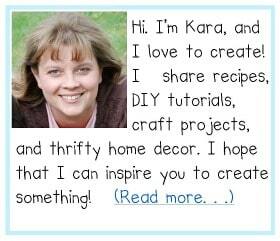 Oh I just love your site! And better start checking more frequently again! I so missed your giveaway!!!! Dang. Thats what having a baby does to you! MIA for a while! haha!!! Hope your Easter was wonderful! 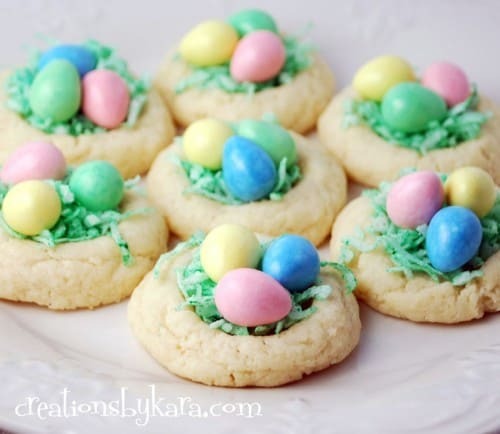 These are going to be a new Easter tradition at our house. Made these for Easter yesterday. They were a hit! Thanks for sharing.